Despite the cold, a hardy group of pro-choice protesters turned out last night with placards and glowsticks to make some noise at the launch of new anti-abortion group Alliance of Pro-Life Students. Around 50 pro-choice Londoners, the majority of them students, waved signs and chanted pro-choice slogans – “Pro-life? That’s a lie. You don’t care if women die!” the most popular – as the launch party attendees (£25 per ticket, £15 for concessions) piled out of black cabs and through the doors of the Thistle hotel, near Marble Arch. There were some great speeches, including one from Kelley Temple, NUS Women’s officer, who made the point that “anti-choice is anti-student”, and reiterated the NUS’s commitment to abortion rights. 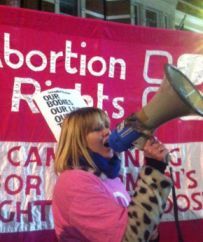 A speaker from the Bloomsbury Pro-Choice group reminded protesters that 40 Days for Life are gearing up for another of their biannual protests – and that BPC would be there to stand up for the right to choose. The usual lone anti-abortion protester was there to protest our protest (! ), and at one point the police officers there to keep the protesters in line tried to move him into the area set aside for us pro-choicers – although they quickly reconsidered when it was pointed out that we were on opposite sides. As ever, it was a great pleasure to be among like-minded pro-choice people, and a big thank you to all who showed up.